Make your party a cool hit with our Sno-Cone machine. The kids and adults will absolutely love it. PLEASE MAKE SURE TO ORDER SUPPLIES AS THEY ARE NOT INCLUDED IN THE RENTAL PRICE. 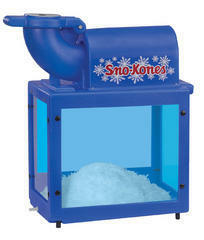 The sno-cone machine uses standard ice cubes made by freezers or bought in the bag from a convenience store.